Positive ID Labels are proud to assist the launch of a new enterprise in the shape of CBD Medic Vapes, a startup into the competitive vape and e-cigarette fluid market. The brand specialises in providing vape fluids direct through their website and via eBay and Amazon. Positive ID Labels were approached to prepare a pharmaceutical themed labels to brand the vape fluid bottles. This was done in-house by staff in the artwork department and provided free of charge to help the fledgeling brand. 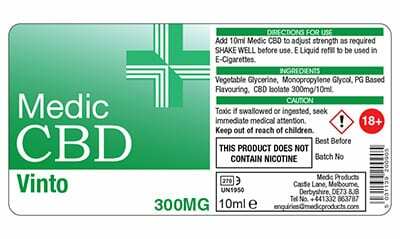 The idea was to give the label a clean clinical look to promote the widely held belief that CBD oil, derived from cannabis, can alleviate a number of health problems. CBD Medic Vapes offers a range of three flavoured vaping fluids, all enhanced with CBD oil. Flavours include Strawberry, Blackcurrant Menthol and “Vinto”, a grape-based flavour. All vape fluid bottles are available in 10ml and 300ml bottles. The 100ml bottle sells for just £15 whilst the 300ml save users by buying in volume, costing just £35. CBD is not the psychotropic part of cannabis, that is THC, a completely different compound. 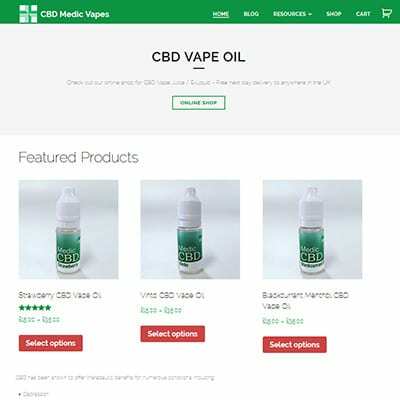 You won’t get high vaping CBD oil! And it would be illegal too. We have been very happy to help this local startup with their project and hope to support them as their business grows. A few of the staff have taken the opportunity to buy some of the products and have all been impressed with the product and the packaging. We hope to help the company as it broadens its range and grows its business. If you require vape labels of any sort or labels for any other products, Dom can be reached on 01332 864895. 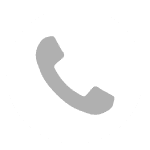 Give us a call and let’s see if we can help you too. Alternatively, fill in the form on the right-hand side of this page and we will get back to you as soon as we can.